The iconic Canadian Rockies Trail Guide has been in print for over 40 years, is in its 9th edition, and has sold over 260,000 copies, but times are changing, so to keep up with technology authors Brian Patton and Bart Robinson have embarked on ambitious project to create a series of Canadian Rockies hiking eBooks. They will be a combination of reformatted existing text and new content created especially for these books, all presented with full colour images and a snazzy design. 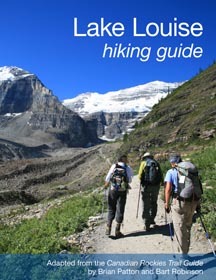 The first of the series is the Lake Louise Hiking Guide, which focuses on one of the world’s finest hiking destinations. It’s available as a PDF through www.canadianrockiestrailguide.com or in Kindle formats through online Amazon stores worldwide.